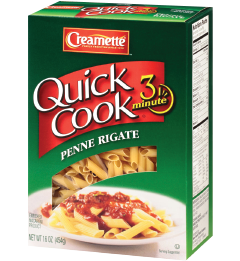 Versatile in size and shape, Creamette® Quick Cook® Penne Rigate takes only 3 minutes to cook! Use it in entrées, side dishes or cold salads. 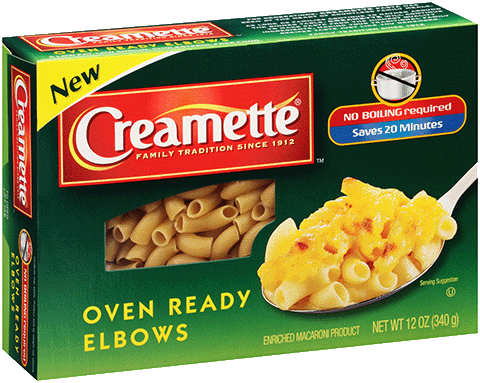 Most pasta sauces are great with Creamette® Quick Cook® Penne Rigate, but thinner sauces will cling to ridges in penne. Tip: Cook 1 box of Creamette® Quick Cook® Penne Rigate and add your favorite pasta sauce with ground meat and top with Parmesan for an easy meal!